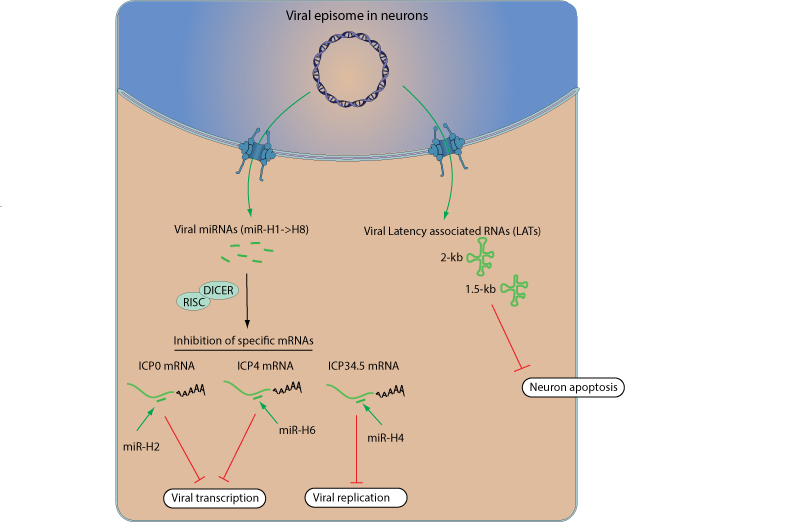 The establishment of latent infections in sensory neurons of herpes simplex virus type 1 (HHV-1) is crucial for life long persistence of infections in humans. To achieve latency, herpes simplex virus encodes two RNAs termed LATs (LATency associated transcripts) that are responsible for the inhibition of apoptosis in neurons . Additionally, herpes genome produces several microRNAs(miRNAs) which are about 22 nucleotide-long noncoding RNAs that target mRNA sequences. Mechanistically, miRNAs are incorporated into the RNA-induced silencing complex (RISC), which guides the recruitment of the target mRNA for degradation and/or translational repression. During latency, 8 miRNAs are synthesized miR-H1 to miR-H8. Three of them miR-H2, miR-H4 and miR-H6 are responsible for the inhibition of viral proteins ICP0, ICP34.5, and ICP4. This inhibition prevents transcription of the viral genome as well as its replication.